Geometry clipmaps are a neat rendering technique for drawing huge terrains in real-time. They were first published in 2004, and a practical GPU implementation was described shortly after. Those articles don’t really explain everything you need to know. In particular there are some some unexplained things that seem to add unnecessary complexity, but are actually crucial. The main motivation for writing this blog post is I tried to simplify those things away then ran directly into the problems they resolve which was annoying and took a lot of time. This blog post by itself is not sufficient for you to write a complete implementation of geometry clipmaps. You should probably take a look at the paper and the GPU Gems article, and spend some time drawing to convince yourself that what I’ve written is correct. The idea behind geometry clipmaps is you upload a mesh that’s more finely tesselated in the middle than around the edges, draw the mesh centred on the camera, and then move the vertices of the mesh to the right height on the terrain. So you end up with more detail next to the camera, and less detail where it’s so far away you couldn’t see it anyway. There are tons of other LOD techniques that achieve the same thing, but clipmaps stand out for their simplicity. You don’t need to run complex decimation algorithms, you don’t need to worry about stitching arbitrary meshes together, you don’t need to select from discrete LOD levels at runtime, it’s easy to tune the quality for different quality settings, and you don’t need to send tons of data to the GPU every frame. You can see that there are several rings, or levels. Each ring has the same number of vertices as the ring inside it but is twice as large, so effectively the resolution halves with each level. You can also see that each level mainly consists of a 4x4 grid of square tiles (the blue ones). 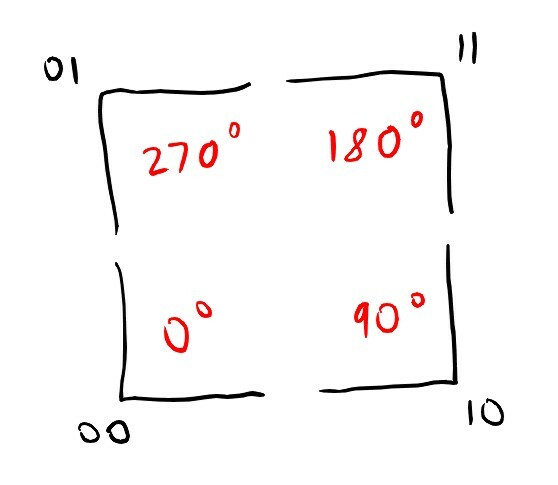 Obviously you don’t draw the inner 2x2 squares except for the innermost level. 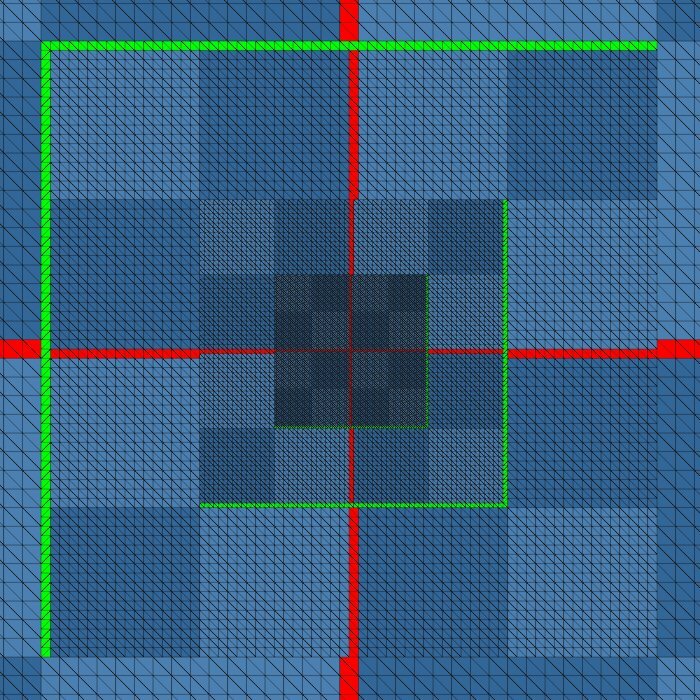 Each level also has filler meshes that effectively split the level into a 2x2 grid of 2x2 squares (the red cross that gets fatter as you move outwards), and an L shaped trim mesh that separates each level (the green meshes). I will explain why these are required in a minute! To draw the terrain, you pretty much centre the rings on the camera and put all the pieces in the right place and that’s it. I will go into more detail on this later, but for now there is one important thing to note. The position of each mesh needs to be snapped to be a multiple of its resolution. So if a mesh has a vertex every two units, it needs to be snapped to positions that are a multiple of two. 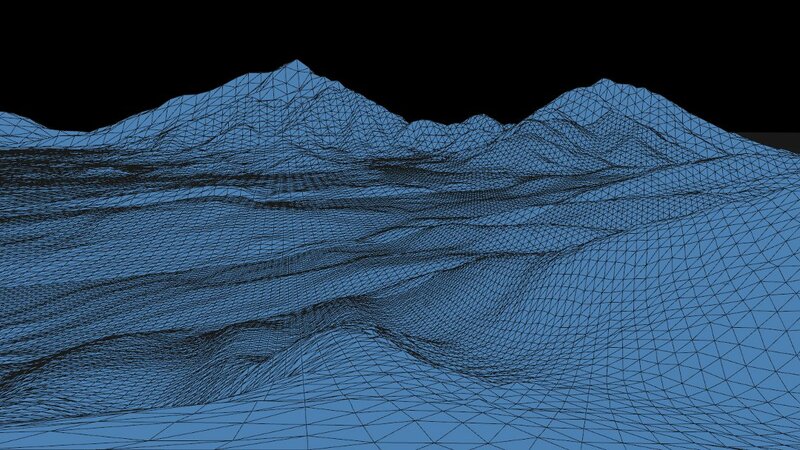 If you don’t do this, vertices move up and down as they swim over the terrain and the terrain looks like it’s shimmering or waving which looks terrible. With snapping, vertices can be added and removed as the level of detail changes, but they never move around, which is a lot less noticeable. In the original paper the filler meshes are two squares wide and the trim meshes twice as big but still only one square wide. I have one square wide fillers and narrow trim, which is the one difference between my implementation and the paper that actually ended up working. It makes positioning trim meshes ever so slightly more difficult but that’s the only difference I can think of. and below I will fill in the blanks. There are a few non-obvious things to do at this point that make rendering simpler later on. You should generate a single mesh with the four filler pieces for a single level. If you generate one mesh and rotate it you get triangulation flips at the 90/270 degree rotations, and that causes triangles to flip as you move around which is pretty noticeable. On the other hand, you can generate a single trim mesh and rotate that. You still get triangulation flips (in fact, you can see the flipped triangles in the top down image. Look at the vertical green strip on the left), but they don’t seem to produce any noticeable artifacts. You need to generate a cross shaped filler mesh that gets centred on the camera. It needs to be its own mesh because the arms are not separated from each other and you need the extra quad in the middle so there’s no hole. Actually rendering the meshes can be made quite simple depending on how you place them in object space. 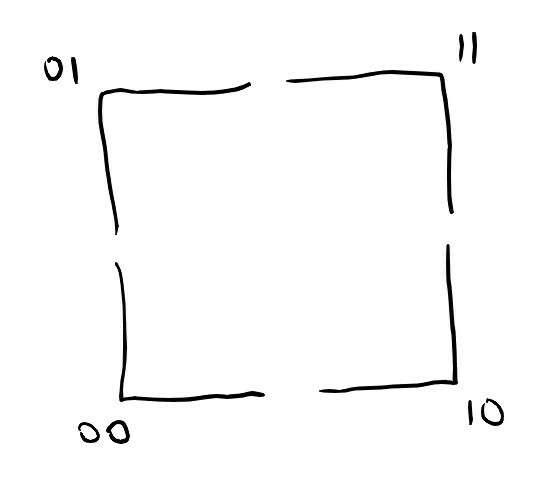 If we say the square tiles have side length of TILE_RESOLUTION, the should be placed so their bottom left vertex is at (0, 0) and their top right vertex is at (TILE_RESOLUTION + 1, TILE_RESOLUTION + 1). Assuming you made them one unit wide too, the filler mesh and filler cross should have the bottom left of the centre quad (the normal filler mesh doesn’t actually meet in the middle but imagine it does) at (0, 0) so you only need to snap and scale them into place. If you made them two units wide they should be centred on (0, 0). 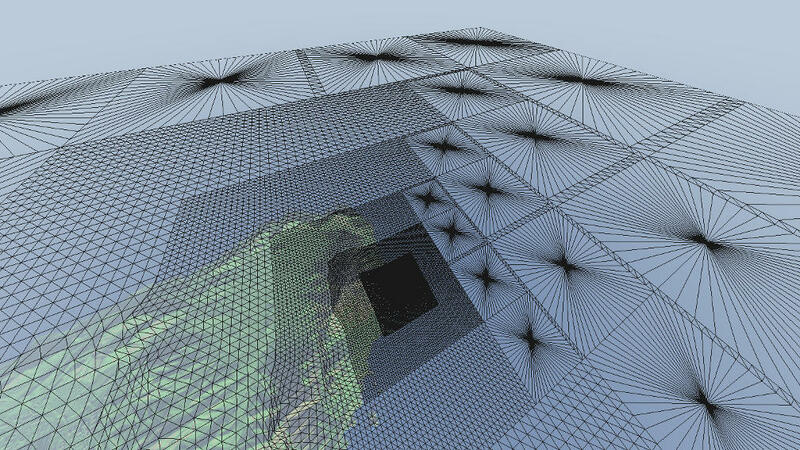 The trim mesh should be positioned so that all you need to do is rotate it to put it in the right place for rendering. I start with an L shape with the bottom left vertex at the origin, then transform it down and left by TILE_RESOLUTION / 2 + 0.5 units. You’ll probably want to draw this one to convince yourself that’s correct, and I expect the +0.5 is only correct if your fillers are one unit wide. 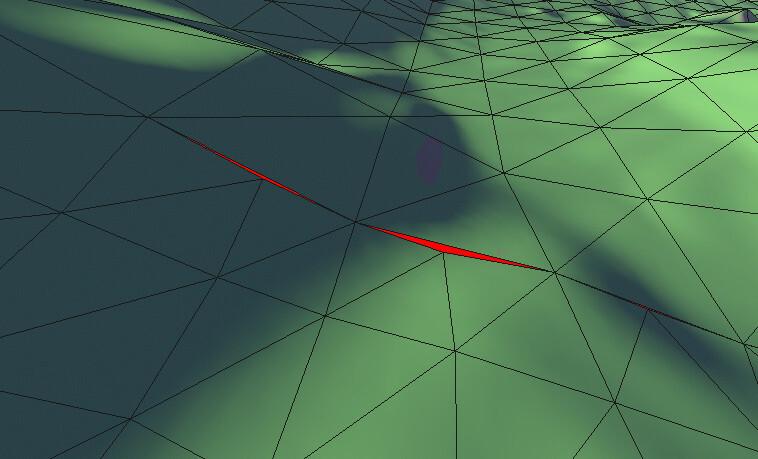 If you look again at the top down image you will notice there are T-junctions at the boundaries between clipmap levels, and T-junctions mean cracks in the terrain. I’ve set the background colour to red in the above image to make them stand out. We aren’t totally spared from having to deal with seams, but fortunately they are pretty simple. If we draw the clipmap levels slightly pulled away from each other we can draw the triangles that we need for the seam geometry. The black lines are tile borders, the grey lines are triangle borders, and the red lines are the seam triangles. But drawing them separately like this is actually a bit misleading. There is no gap, and the vertices at the coarser clipmap level exactly match some of the vertices at the finer level. I’ve drawn green lines between vertices that share the same position, and I’ve drawn the triangles we actually need in red. It’s around one third as many, and we don’t need to do anything special at the corners. When you generate the seam mesh you should put the bottom left corner at (0, 0) in object space. Since each level as you move outwards is twice the size of the previous level, we can compute the scale of each level as float scale = 1 << level;. Then we want to snap the camera position to be some multiple of scale, which can be done like v2 snapped_pos = floor( camera_pos / scale ) * scale;. Placing the tiles is nice and easy. You find the bottom left corner of the bottom left tile and place each tile relative to that. Don’t forget about the fillers though! There’s nothing specific to D3D/GL here, but you do need to understand my rendering API. renderer_uniforms appends all of its arguments to a big uniform buffer, and returns an offset into the buffer and the size of the data. renderer_draw_mesh enqueues a draw call, and draw calls include the offsets and sizes of the uniform data they need. At the end of a frame the entire constant buffer gets copied to the GPU then the draw calls get submitted. I’ve written more about it in this old post if that doesn’t make sense. Finally we have the trim meshes. We need to rotate them into place which is a little more complicated than what we’ve seen so far. And the two bits can be interpreted as decimal 0 to 3. So when rendering we can figure out which flips we need, and use those bits to index into an array of rotations. To decide which bits to set, we need to figure out where the current clipmap level is placed relative to the outer level. If the current level is in the bottom left of the hole, the trim needs to go in the top right and we set both bits. If the current level is in the top right, the trim needs to go in the bottom left and we use 00. And so on. The logic to figure out which bits to set is a bit tricky. I do it by looking at the difference between the current level’s snapped camera position and the next outer level’s snapped camera position. If there’s less than one unit difference between the two in both the x and y axes, the tile will be placed in the bottom left and the trim should be placed in the top right. If there’s more than one unit difference we set the bit for that axis. The rotations should be exact, like m4_rotz270 should return a hardcoded matrix of zeroes and ones rather than calling some generic rotation function. I suspect it may be possible to end up with cracks in the terrain if you go through a rotation function, and it’s easy to hardcode it and be sure so why not. The vertex shader is pretty simple. It transforms the mesh position from object space to world space (it’s a bit convoluted, it could all be done with a single matrix multiply), samples the heightmap using the world space xy coordinates, then finishes transforming the mesh into clip space. The only subtlety here is that if you have a normalmap etc you should sample it in the fragment shader and not in the vertex shader. If you do it in the vertex shader you lose lots of detail and it looks horrible. The only different between those two islands is the left island samples the normalmap in the vertex shader, and the right island does it in the fragment shader. The geometry is exactly the same! Obviously the answer is “as an image” but it’s a bit more subtle than that. We need 16 bits of precision for the heightmap because 8 bits looks blocky and bad, and we would really like it to be in a GPU compressed texture format because it helps with performance and VRAM usage. BC5 has a pair of (roughly) 8-bit channels, so we can store h / 256 in one and h % 256 in the other to get 16 bits of precision. I didn’t do any scientific tests but I did play around with swapping between lossless and BC5 terrains and it seemed fine so I stuck with it. For a 4k terrain it ends up using 4k x 4k x 1 byte per pixel memory, so 16MB of VRAM for the heightmap. You’ll probably want a few more channels than that, probably a normal map, maybe a horizonmap and AO map for the lighting. The normalmap and horizonmap are BC5 too, the AO map can be BC4 which makes it 3.5 bytes per pixel, so 59MB total. If we expand the terrain to 8k then that’s 235MB, which is probably still ok. Going beyond that is probably too much though without more cleverness. We need to be able to decode the terrain image on the CPU too so we can use it for things like collision detection. BC5 should be simple to decode, and indeed the code for it is simple, but my decoder doesn’t exactly match the GPU’s! If anyone can see the problem please email me! It’s pretty normal for games to be set on an island in the middle of an infinite ocean, because it neatly sidesteps the “invisible walls are immersion breaking” problem. To help with the illusion, we want to really draw ocean all the way to the horizon. So we need some extra skirt geometry around the coarsest level clipmap. We could add more clipmap levels but that’s wasting triangles since all of them will sample Z = 0. 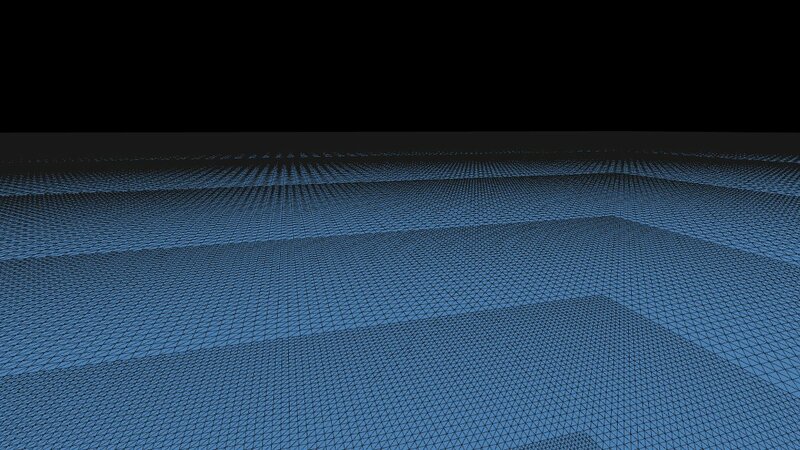 Generating the mesh is pretty simple. You know how large the coarsest level clipmap is and how many vertices go along each edge, so you make a square that fits around the entire terrain and add triangles fanning out from it to some vertices arbitrarily far away. There are tricks you can do to project vertices to the far plane, but I couldn’t figure out how to make fog work with that so I just put a lot of zeroes. If anyone knows how to do this properly please get in touch! Continuing with the island idea, you probably want to be able to stand on one side of the island and have the clipmaps reach all the way to the other side. 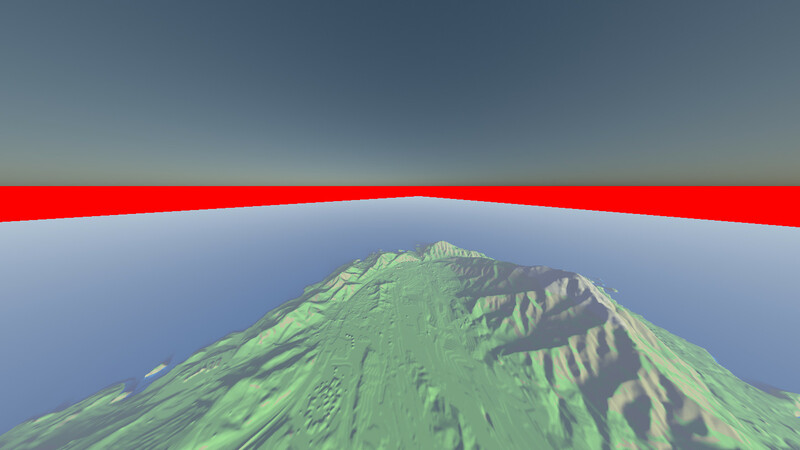 Which implies that they extend that far in the other direction too, meaning you have a lot of vertices over the ocean and outside the terrain. Make sure to copy intervals_overlap from the ryg blog ! Even though the differences between adjacent clipmap levels are pretty small, the LOD transitions can be noticeable in some cases. The idea here is that you blend between clipmap levels as you get close to the clipmap boundary. I haven’t implemented it so I have nothing to say here, but if I ever get round to it I shall update this section. You should now have the knowledge to get started on an implementation of geometry clipmaps without running into the problems that I did. It’s not a huge amount of code (less than 1 KLOC), but the implementation is tricky in some places, and especially mesh generation is an absolute slog to get right. The Witcher 3’s landscape presentation. Clipmaps in a real game!